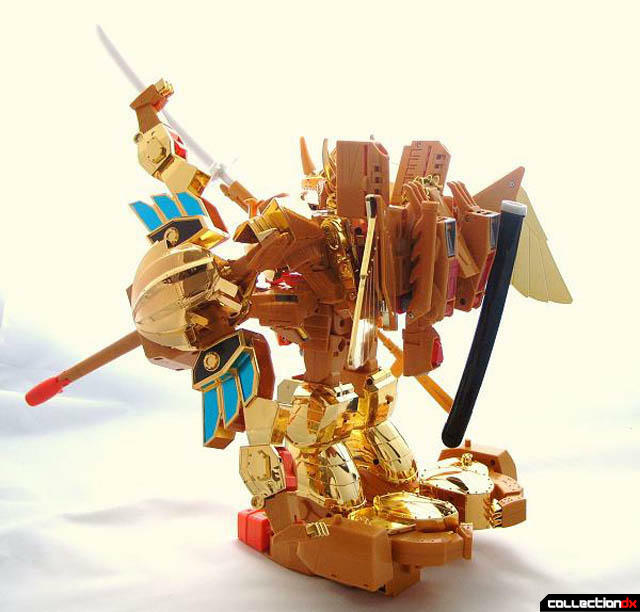 The Brave of Gold Goldran is a Japanese anime television series series begun in 1995, created by Sunrise under the direction of Shinji Takamatsu, and was the sixth in the Yuusha meta-series funded by Takara and produced by Sunrise. Goldran follows the adventures of three young boys who are tasked with finding alien robot fighters, or Braves, that are sleeping in the form of crystals. Their major antagonist is the flamboyant and thoroughly incompetent Walter, and the villains that follow him are often similarly humorous. The entire show is extremely focused on comedy and silliness almost to the exclusion of much in the way of storytelling, although the series does develop some running plot lines towards its end. In terms of television ratings, Goldran was the peak of the Brave series' popularity. 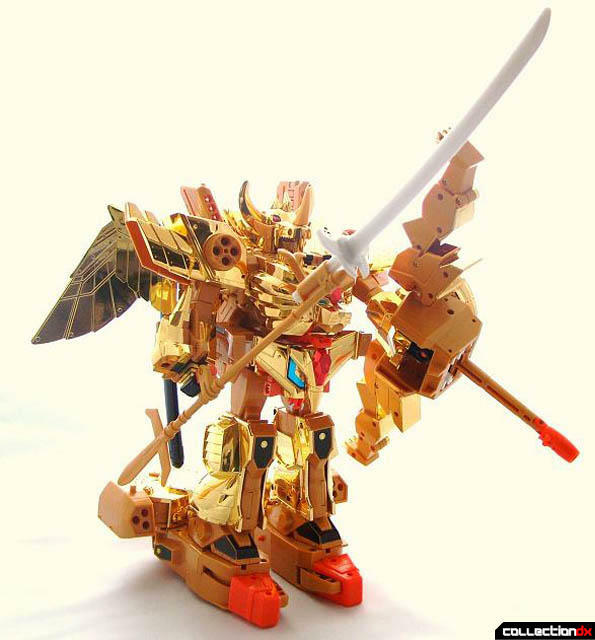 After reviewing Goldran, Leon Kaiser, and Sorakage we are left with the ultimate Combined form of all 3 mecha.... "GREAT GOLDRAN"! Great Goldran is a solid chunk of quality plastic standing at approximately 13 inches tall and weighs in it at almost 4 lbs! Articulation is limited to the shoulders. Hey, but who needs articulation when you have all that missile firing goodness? Great Goldran has a staggering 27 launchers including the missile that launches from his massive crossbow type gun made up of Leon Kaiser's front legs, chest, and tail. Great Goldran in pretty impressive, yet "busy" looking figure. I think the thing that is one of my favorite features about most of the Brave Series figures may detract from this figures aesthetics. I am talking about being able to attach almost all the extra parts some place on the figure. He has alot going on! Heck, just look at the backside and you will see the sword sheaths of both Goldran and Sorakage. Way too much kibble. Speaking of swords, Leon Kaiser's staff and Great Goldran's sword can combine to make one massive weapon. There is not much else to say that hasn't already been said in the previous reviews of the individual figures, so to wrap things up, Great Goldran is really a "busy" figure to say the least. It does however have undeniable shelve presence. The size and the array of firing gimmicks still make this over the top figure a winner in my book! The samples for today's review was provided graciously by our friend Jeff Stein over at High End Transformers. Please check them out or just click on the Ebay links at the bottom of the page for a direct link to the item reviewed today. Ah, there he is! My favorite Brave toy of all time! 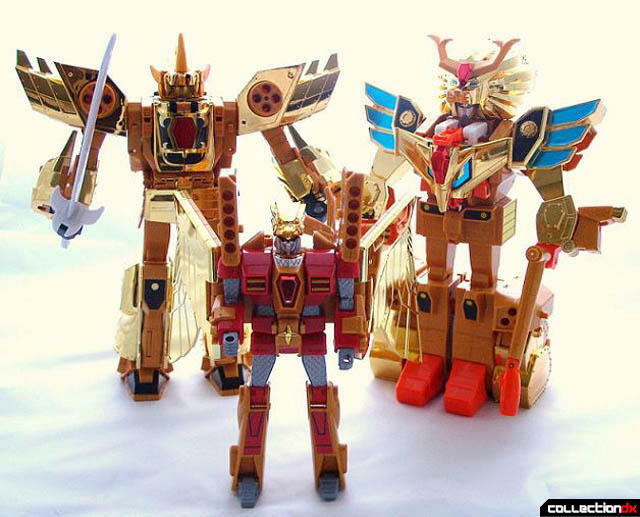 Granted, I've always loved GaoGaiGar (as a cartoon) the most...and his Takara DX toy is bangin' in its own right, Great Goldran is just amazing. I actually don't think it's too busy looking. Yeah, there's lots of kibble and whatnot, but it's far from many other trainwrecks out here (yes, super sentai, I'm looking squarely at you). Great pics, Dan. Thanks for these write-ups! I must say, he looks a lot more... clustery than some of the most clustery SS bots to me. Kinda like they grabbed random parts and threw them together, like the Lion-Bow. Mwa-ha-ha-ha... Excellent response Rankarana! I couldn't have said it better myself. "I must say, he looks a lot more... clustery than some of the most clustery SS bots to me. Kinda like they grabbed random parts and threw them together..."
I was about to say the exact same thing. 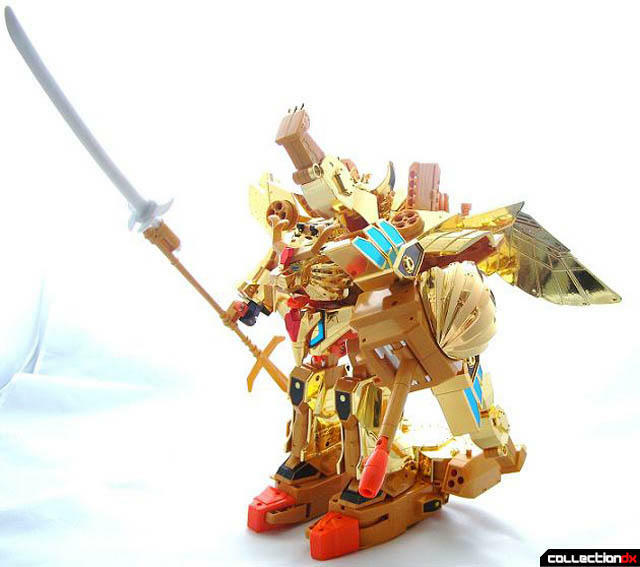 This sticks out way more and has a lot less cohesion than even an [average] Cluster-fk Megazord. Wait what? Tell me Samurai Haoh (the DX one) looks less clustery than Great Goldran. Go on. You're right- that's actually a difficult one to answer. The awesome candy toy version makes up totally for it, same with Engine G12. And, frankly, I feel the variation in colour even in the DX sets makes it all look more distinct, compared to the amorphous blob of gold there. Also, the biggest (working) combination I can think of comes up with a really streamlined bot- Dairugger. I'll have to agree there. The Super Sentai Candy toys look awesome. I still need Mogyudaioh to make Samuraio Haoh. I see the DX one and it just looks so cobbled together but the Candy toy one looks great. I feel that if Leon Kaiser's mane was orange (like the Brave Revival version) it would've help in the design. Sure, he's a cluster****, but he's got the colour seperation stuff going on. That at about a third (or even a fourth) of the cost of a Sentai mecha, you can get an articulated candy toy that still combines with the other sets in the range? That's why I'm not even mad about Shinkenger toys not coming out in America. Screw it, I'll just get the candy toys off of eBay. Yep. I'm a bit annoyed that I started with Shinkenger. I really want the candy toy G12 but I'll have to settle for the Microzord one. All I want is a poseable Daigoyou. That's all. The Candy toy one is pretty poseable. 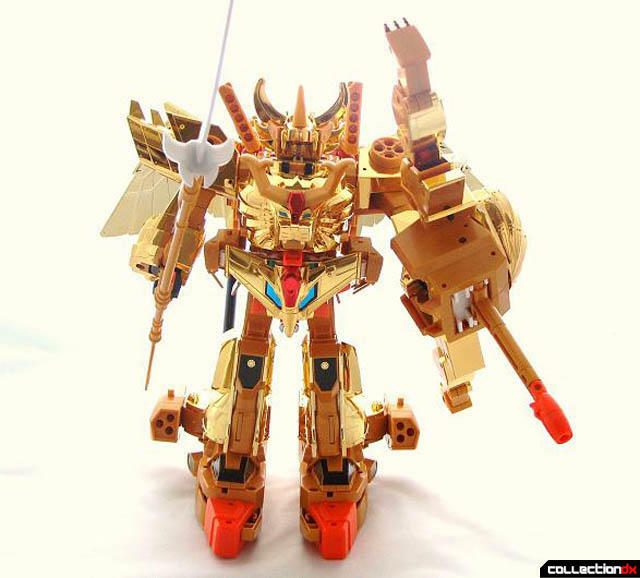 Ah, the glorious Liberace Mecha. I love this thing. Pics are great, but it's impossible to capture the sheer presence of Great Goldran on film. That's why he used a digital camera!!! lol Admittedly Great Goldran looks a lot better when you see him up close rather than through pictures. This is my favorite Brave combiner as well. Maybe he doesn't stand up to 2000's Megazords/Sentai robots, but (a) the toy is 15 years old, and (b) his individual vehicles/animals turn into robots, so engineering was put into that instead of hiding kibble. WOW! I bet Jeff Stein wishes he could have been selling used Goldrans on Ebay for $152.50 + shipping!!! For just Goldran? Unbelievable. So after seeing that, I bought one NIB directly from S. Korea for $88.00 including the shipping. Guess these are hot right now for some reason.